Click the image to download a PDF of the registration form. Join Mariko Hirose from the NYCLU and Alison Macrina of the Library Freedom Project for a workshop on safeguarding patrons’ intellectual freedom from privacy threats. Mariko will begin the workshop with a a�?Know Your Rightsa�? training for librarians, detailing the contours of federal and local privacy law, as well as providing information on how to respond when served with an information request such as a National Security Letter, administrative subpoena, or warrant. Alison will close the workshop by detailing some of the surveillance threats from intelligence agencies, corporate entities, and the hacking industry, and will demonstrate technology tools that can help protect privacy. These tools can be installed on public computers or taught to patrons in computer classes, and provide practical ways for everyday people to prevent search tracking, browse the web anonymously, and encrypt some of their online communications. The range of tools covered offer solutions for people at all levels of technical ability. 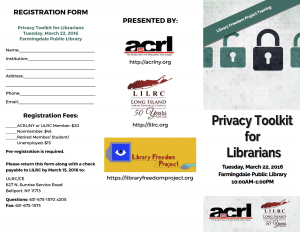 This workshop is presented by The Library Freedom Project, a partnership that teaches librarians about privacy rights, law, and tech tools to protect patrons from dragnet surveillance. Nima Fatemi is an Iranian independent security researcher, focused on encryption, anonymity, privacy and censorship circumvention technologies. He is a core member of The Tor Project and the chief technologist of Library Freedom Project. Mariko Hirose is a staff attorney at the New York Civil Liberties Union, where she has worked on cases involving free speech, privacy, government transparency, and criminal justice.A� Prior to joining the NYCLU, she was a fellow at the Speech, Privacy, and Technology Project of the American Civil Liberties Union and a clerk to the Honorable Stephen Reinhardt of the United States Court of Appeals for the Ninth Circuit. Alison Macrina is a librarian, privacy rights activist, and the founder and director of the Library Freedom Project, an initiative which aims to make real the promise of intellectual freedom in libraries by teaching librarians and their local communities about surveillance threats, privacy rights and law, and privacy-protecting technology tools to help safeguard digital freedoms.